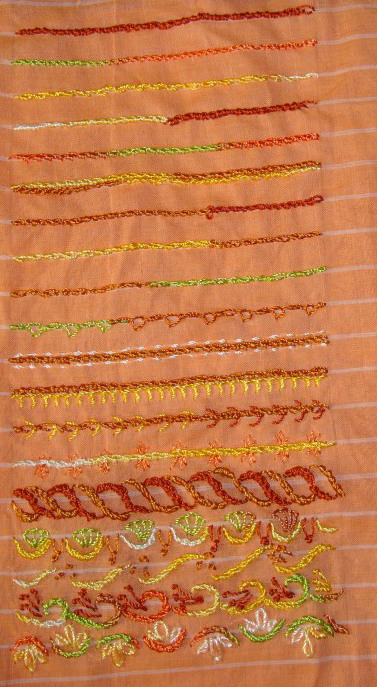 After working this stitch in straight lines, in these samples the stitch is worked in curves. 8. Portuguese stem is stitch worked over a pattern in the first sample in two colours. Curved Portuguese stem stitch worked with buttonhole wheel variations and Italian border stitches in the second sample. 9. Some more samples of this stitch worked in curves with other stitches, namely- french knots, pistil stitches and detached chain stitches. 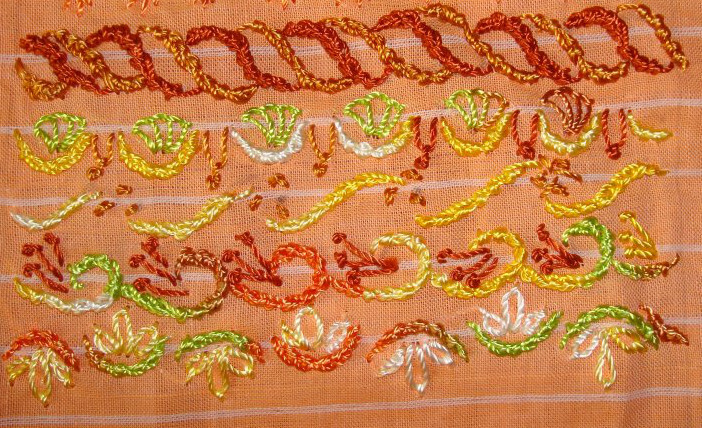 Though the stitch looks like decorative braid, it is still a line stitch. I tried some variations with some stitch combinations. 5.The first row is combination with twisted chain stitch and the second row with closed buttonhole stitch. 6. Running stitch rows are worked on both sides of Portuguese stem stitch in the first sample. Buttonhole stitch is worked on one side in the second sample. 7. 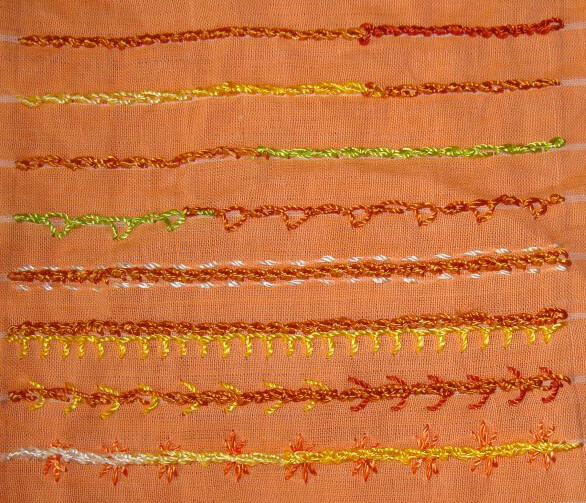 Portuguese stem stitch is worked over fly stitches in the first row, and over sheaf stitches in the second row. 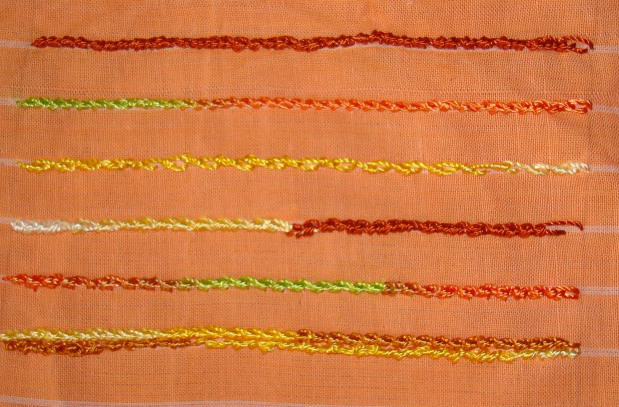 This week’s stitch on the TAST 2013 challenge by SharonB is Portuguese stem stitch. This was the first stitch I learnt from the Anchor booklet of 100 embroidery stitches. This was years ago. At that time I knew chain stitch, back stitch and stem stitch and my mother had taught me herringbone filling stitch. I was excited to learn new stitches from that booklet. I learnt only a few stitches and later moved on to using that book as reference. I never used this stitch on any projects. 2. The stem stitches are worked longer and with space between the stitches in the first row. The stem stitches are longer but the needle is taken out at the midpoint of the previous stitch in the second row, I wanted to have a thicker line in this variation. 3. The stem stitches are worked at an angle in the first row. Two rows are worked together in the second sample. This row looks like a braid.